A few days ago I asked a Seer, Little Rain Drop, to ask Jesus if we could do this, as Russia is about to fulfil Our Lady’s Prophecy – that Russia would spread its errors (Communism) around the world, if the Consecration is not done. 5 am on the West Coast of the U.S.A. I would request a Mass to be said and Our Holy Mother Crowned with our Consecration. And to add to this answer, it has come to my notice that the Great Miracle of Garabandal will be next year on Maundy Thursday, in April, on the Feast of a Spanish Martyr of the Eucharist, Prince Hermenegild. So the Warning could be on the 28th December 2016, or during Holy Week in 2017 – which means the Third World War will come before then. The world money will collapse and the Church will go into schism and the Antichrist will make himself known. Jesus, once again, confirmed all was possible now. 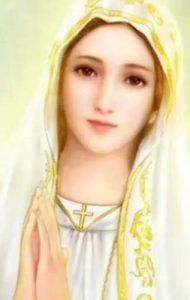 So, dear souls, let us unite as one big Army for Our Lady and Consecrate Russia to Her Immaculate Heart. Remember next year is the 100th year of Her Apparitions at Fatima, Portugal. Sister Lucia, St. Francisco and St. Jacinta – Pray for us. Attached to this is the Consecration to be used – or one you wish to use. Prostrate before Thy Throne of Grace, O Queen of the Most Holy Rosary, we intend to fulfil, inasmuch as it lies within our power, the request which Thou didst make when appearing to us at Fatima. The abominable sins of the world, the persecutions directed against the Church of Jesus Christ and still more, the apostasy of nations and of Christian souls and the forgetfulness, of Thy Maternity of Grace by the greater part of mankind, overwhelms Thy Sorrowful and Immaculate Heart, which is so united in its compassion to the sufferings of the Sacred Heart of Thy Divine Son. That so many crimes might be atoned for, Thou didst ask for the establishment of the devotion of reparation to Thy Immaculate Heart and, in order to hold back the scourges of God, which Thou hast foretold, Thou hast made Thyself the Messenger of the Most High, requiring of the Vicar of Christ, in union with all the Bishops of the world, the Consecration of Russia to Thy Immaculate Heart. Alas, the Message has not yet been heeded. That is why we desire to anticipate the happy day on which the Sovereign Pontiff will finally accede to the request of Thy Divine Son. Without attributing to ourselves an authority which we do not possess, but penetrated with the solicitude for the lot of the entire Church, by a humble supplication addressed to Thy Immaculate Heart and united to the faithful Bishops, Priests and faithful, we have resolved to comply for our part with the wishes of Heaven. Deign therefore, O Mother of God, to accept first of all the solemn act of reparation, which we present to Thy Immaculate Heart for all the offenses by which, with the Sacred Heart of Jesus, It is assailed on the part of sinners and the wicked. Secondly, as much as it is within our power, we give, deliver and Consecrate Russia to Thy Immaculate Heart. We beseech Thee, in Thy Maternal Mercy to take this nation under Thy Maternal protection, to make of her Thy domain, where Thou reignest as Queen, to make this land of persecutions a land of election and benediction. We implore Thee to render this nation so submissive unto Thee that, converted from her legalized godlessness, she might become a new kingdom of Our Lord Jesus Christ and a new inheritance for His gentle sceptre. May she moreover, having returned from her schism of old, enter anew the unity of the One Sheepfold of the Eternal Shepherd and thus submitted to the Vicar of Thy Son, may she become an ardent apostle of the Social Reign of Our Lord Jesus Christ over all the nations of the Earth. Likewise, we implore Thee, O Mother of Mercy, by this manifest miracle of Thy all-powerful intercession, to make known to the world the truth of Thy universal mediation of Grace. Deign, O Queen of Peace, to bring to the world that peace which the world cannot give: peace of arms and peace of souls; the Peace of Christ in the Kingdom of Christ and the Kingdom of Christ through the reign of Thy Immaculate Heart, O Mary. Amen.